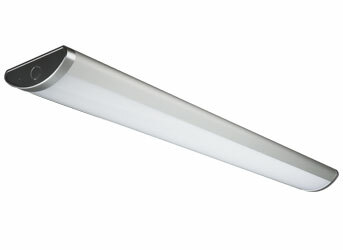 Energetic Lighting’s E2WR and ELYWL series LED surface mount wraps showcase a soft fixture form factor while delivering up to 4200 lumens in their 4-ft length, while drawing only 40 watts of power. These versatile lights can be used for general room lighting, or as a functional work area lights with an all white or silve accent appearance. Installation is quick and simple when mounting into standard ceiling junction boxes. Constructed with a durable steel housing body and LED lifetime rating of at least 50,000 hours, these rugged wrap lights are designed for many years of reliable operation.